Side 1 printed with 2 PMS colors using heavy coverage. 24pt C1S White Semi-Gloss stock coated with Matte Lamination. H3 business card slits on left pocket. 1" metal rings. 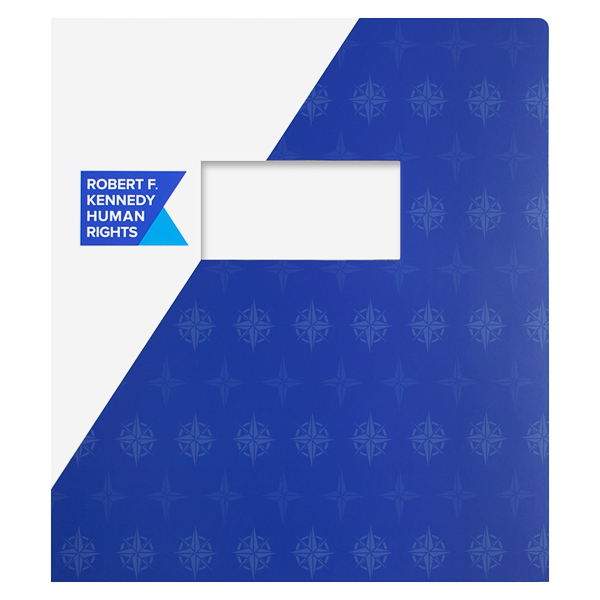 This stylish design helps the Robert F. Kennedy Center promote social justice. Swaths of royal blue crossing both covers mimic the logo's diagonal edges. Icons in the blue areas resemble a compass to symbolize positive progress and morality. Contact information on the back cover lets organizations or individuals connect with the group to work on social justice projects together. Measuring 4" x 2", the die-cut window lets recipients preview a title page to their 8 1/2" x 11" presentation packet. The binding mechanism features three rings that come in 1/2", 3/4", or 1" sizes to accommodate large or small amounts of paper. A right pocket lets you place supplemental or loose document to create suspense, as they will remain a surprise until the recipient peruses the papers in the rings. The pocket's v-split cut keeps its edges clear of the binding mechanism.